That Family Blog: Maple Sugaring: What it's about and how to do it for cheap.. 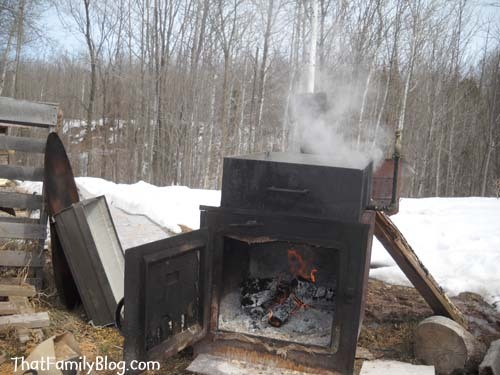 Maple Sugaring: What it's about and how to do it for cheap.. 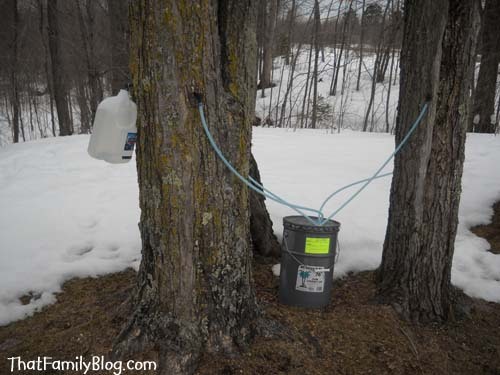 I'll be honest; if you are looking to make a quick buck, selling Maple syrup is a terrible way to do it for a non-pro, even though it goes for over $60/gallon. That being said, if you happen to live up north and also happen to have a few Maple trees, there's no reason you have to break the bank to get started, and the results are very rewarding! We've been having a pretty good run this year, and I thought I'd share some of the things we've learned over the years. 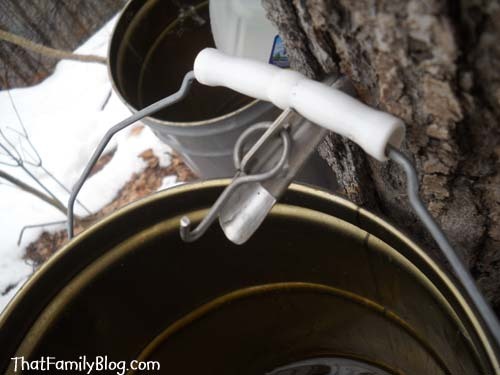 Now, for those of you who have never seen Maple sap, it isn't the sticky, thick substance that immediately comes to mind from your Christmas tree pruning experience. In fact, it's pretty much water, with some extra minerals and 1-3% sugar. It takes up to 60 gallons of sap to boil down one gallon of syrup. 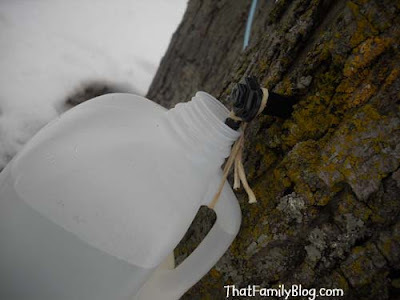 For those of you who don't feel like going through that hassle, putting in a tap or two and drinking the sap straight is still a refreshing and very healthy thing you can do, even in the city! Keep in mind that the slightly-sweet sap only has a shelf-life of a week or two in the fridge, until it starts to ferment. I'm not going to get into too much detail here, but let's go tap some trees! The goal is to put a small pipe, (around 1/2'' diameter or less), about 1.5'' deep into the tree. 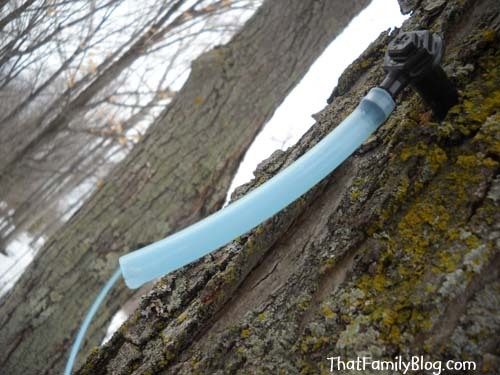 The pipe should be tapered for a tight fit, or much of the sap will "leak" out around the edges.. We've tried many kinds of pipe, looking for an inexpensive alternative to the $3/ea commercial pail taps. A 4'' length of 1/2'' cpvc, tapered on one end with a sander is serviceable. 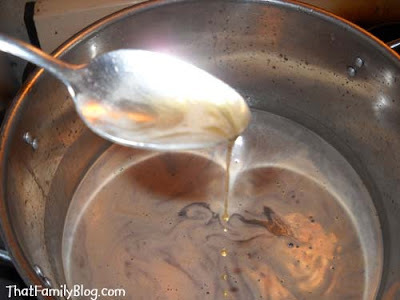 Avoid copper, as it quickly oxides from the sap. The diy taps work well enough, but this year we broke down and started using a more commercial (but still cheap!) option. These plastic hoseline taps are meant to feed into a large commercial sap collection system; they're only $0.50/ea and the hose is $0.18/foot. We combined the plastic taps, 4'' sections of hose and repurposed milk jugs, as you can see in the following pictures. 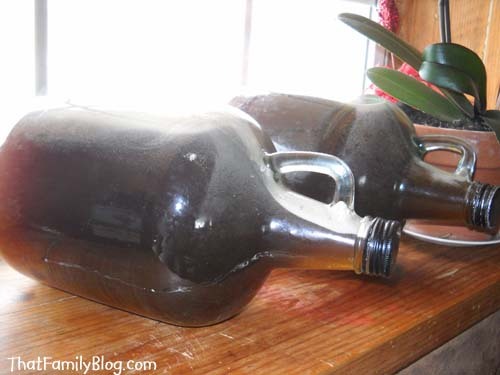 The jugs are simply hung from the taps with a loop of twine. So far we are extremely happy with this system, and now that we are doing over 100 trees, they are much more convenient than the cpvc pipes. 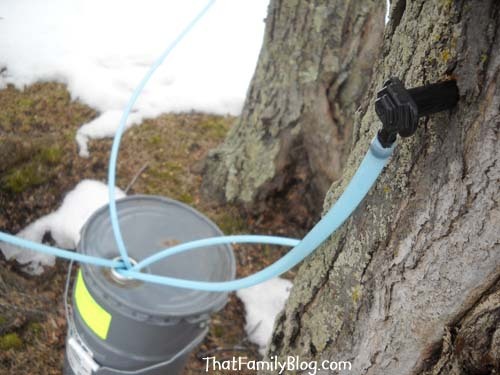 This is another neat thing you can do with the pipline taps, if you have a cluster of maple trees in close proximity. This is your typical steel pail-tap, used with a 5 gallon pail here. 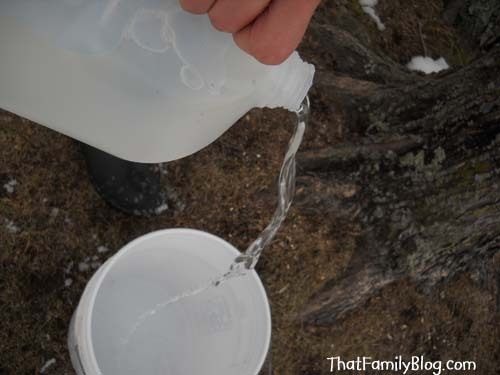 Our best trees give about a gallon a day, so a pail this large is overkill. 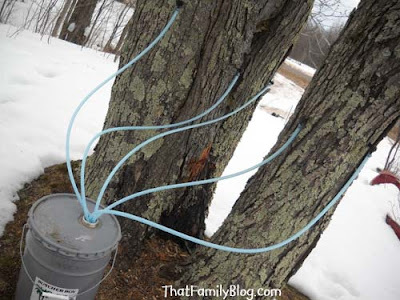 Straining the sap into a barrel. 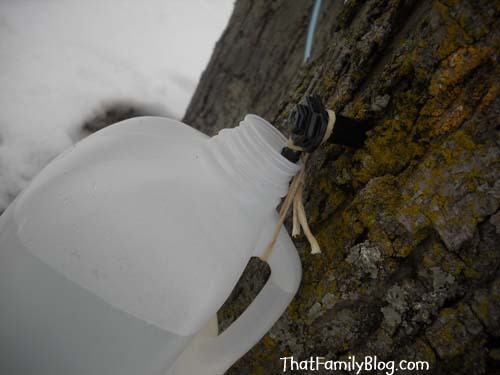 There seems to be many bugs that enjoy the sweet sap as much as we do! 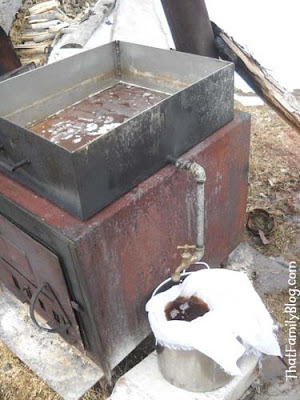 We keep adding sap until there is enough 'almost-there' syrup for about three gallons. 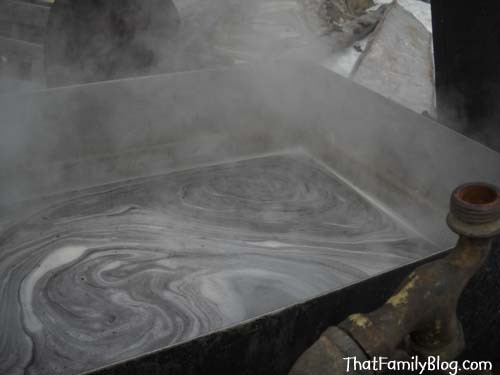 Straining the syrup can be a pain, as there is this "sugar sand" sediment that quickly clogs a fine cloth. We strain through a coarse cloth and accept a bit of sediment..
How do you know when it's ready? Well, there are a few ways, but I generally just use a good ol' spoon. I keep boiling the syrup down slowly on the stove until I feel the consistency is about right.. It's not the best method for long-term storage, but we will be using this up within the next year, so I'm not overly concerned about it. There we have it! We're up to nearly 6 gallons of syrup for the year, and it's still coming. It's been a pretty good season for us! 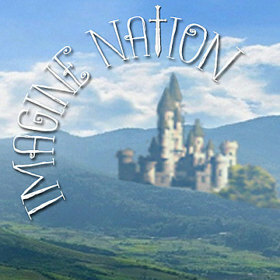 Hope that little insight inspires the curious among you to give it a try!